60 Quick Baby Knits has a variety of projects ranging in size from 6 -18 months - most with multiple sizes. They include booties, hats, mittens, leg warmers, sweaters, cardigans, blankets and a pillow. There are a variety of knitting techniques including cables, stranded, slip stitch, intarsia and lace but there are also many projects that would be easy for a beginner. A great way to try a new technique is with a small project so why not try one of these small baby projects. 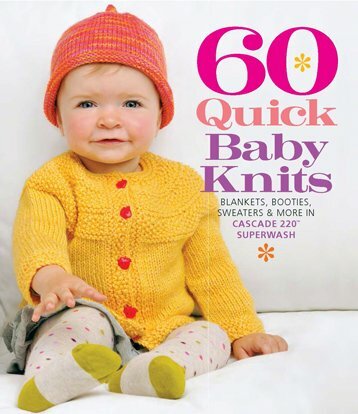 60 Quick Baby Knits is a great addition to your knitting library and full of the cutest designs and classic yarn. So if knitting for babies is for you, this book is a perfect fit! YG recommends Cascade 220 Superwash Merino for these adorable designs!